Herald and Review Library: Photo Macon County Draftees standing in front of the courthouse; Article on back of photo: "These men from the Macon county rural board left Decatur recently for Peoria where they received medical examinations and many were inducted into the U. S. Army. They re left to right: First Row: Dale Westbrook, John H. Butterfield, George W. Dotson, Robert W. Lancaster, Roy O. McLaughlin, James C. White, Ronald E. Wise, Ernest E. Miller, Carl V. Brinkoetter and Dennis Bobbett. Second Row: Joseph F. Ferry, Wilbert M. G. boyer, William H. Shuppara, Otto E. Dworak, Harold E. Ridlen, Joseph C. Turner, Matthew Stoll, Melvin R. Stevens, Edward J. Michemer, and Harry D. Stolley. 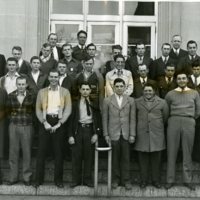 Third Row: Charlies Sears, Charles R. Flesch, William F. Lewellen, Glenn D. Oakleaf, Billy Kunzeman, Henry R. Burcham, Wilfred J. Esry, Paul E. Kelley, Burns R. Flesher, and Herbert M. Hart. Fourth Row: Robert C. Boyd, Will H. Palmer, and Gene Creekmur." Herald and Review, “Photo of Macon County, IL. 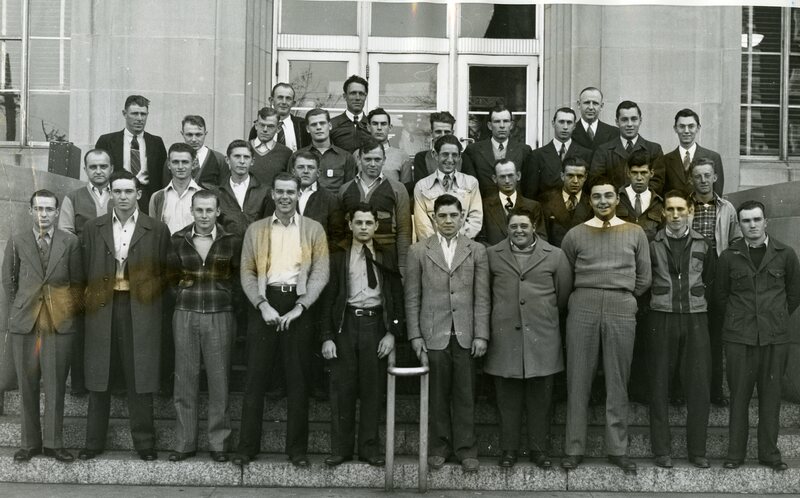 Draftees in front of the courthouse steps,” Decatur Illinois Public Library Local History Photo Collection, accessed April 24, 2019, http://omeka.decaturlibrary.org/items/show/1761.